The OGF Open Cloud Computing Interface Working Group (OCCI-wg) is developing a clean, open API for ‘Infrastructure as a Service’ (IaaS) based Clouds. IaaS is one of three primary services: Infrastructure, Software, and Platform of the emerging Cloud industry. 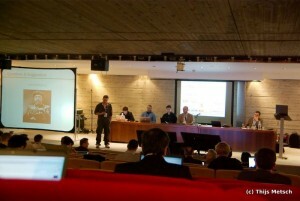 OCCI–wg is a working group of the OGF established in March 2009. The group has active membership of over 200 individuals and is led by four chairs from industry, academia, service providers and end-users. Several members are from commercial service providers that are committed to implementing the OGF-OCCI specification. 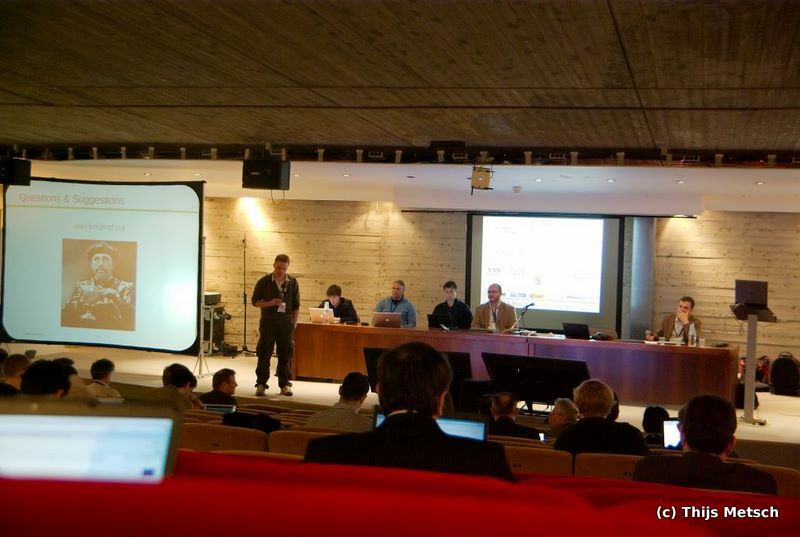 Ignacio and me during the founding session. The idea of cost reduction, GreenIT and on-demand resource planning lead to the idea of having elastic environments which scale on demand. Today’s demand for elastic environments in which public Clouds (like Amazon’s EC2 offerings) and private Clouds (locally installed resources) interoperate (Hybrid-,Federate- or InterClouds) show the need for standardization. Differentiation in the offerings is done by extensions and prices not by core functionalities. The need to interface all Cloud providers (private as well as public) in the same manner shows the need for standards for core features. Therefore main drivers behind the specification are to ensure Portability, Interoperability and Integration between Cloud service providers and end-users. OCCI will be a very slim RESTful based API which can be easily extended. Without the overhead of many similar protocols the REST approach allows users to easily access their services. Every resource is uniquely addressed using a Uniform Resource Identifier (URI). Based on a set of operations – create, retrieve, update and delete (CRUD) – resources can be managed. Currently three types of resources are considered: storage, network and compute resources. 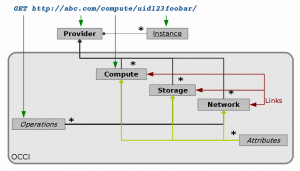 Those resources can be linked together to form a virtual machine with assigned attributes. For example, it is possible to provision a machine which has 2GB of RAM, one hard disk and one network interface. The Specification itself is setup to be modular. Therefore it is delivered as a document series. Each of the documents focuses on a certain topic and can be independently used from the others. Until now the OCCI specification consist of four modules: The Core specification, a description of how IaaS based resources should look like, a HTTP rendering for easy machine-to-machine management and a XHTML rendering for creation of human-to-machine interfaces. An HTTP GET operation is performed on an unique URI representing a virtual machine of Solaris zone. The URI encapsulates the instance and provider id. 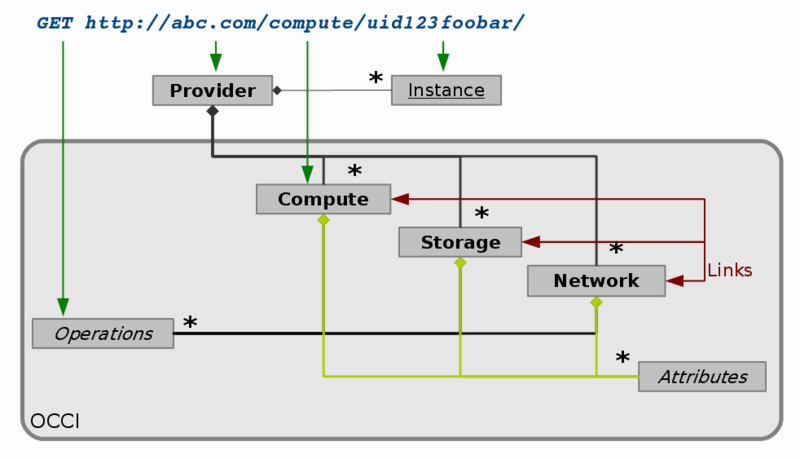 The OCCI specification describes how operations can be performed upon resources (Compute, Storage and Network). Resources can be linked so they described e.g. a Virtual Machine. Each resource type has a certain set of attributes (e.g. CPU speed, Storage size and IP addresses). The CRUD operations can be performed upon the resources. During the past months two reference implementations have emerged. Based on drafts of the specification a group of the University of Madrid (UCM – OpenNebula) and a group inside of the National Institute of Nuclear Physics (INFN) created reference implementations. The idea which led to the creation of the OCCI group has been triggered and sponsored by the EU project RESERVOIR. RESERVOIR tries to establish a tool suite for Cloud computing middleware in which the interfaces should be standardized. One of these interface will be an implementation of the OCCI specification. The work done within the group has gained an significant impact in the Cloud community. Blogs, technology related websites, twitter (Tag #OCCI) and journals have driven and reported about OCCI thanks to the open process of the group. Currently the OCCI group is finalizing and documenting the initial draft specification. After only half a year the OCCI group succeeded in delivering on of the first standards for the Cloud community. This could be achieved thanks to the big momentum the group has had. Due to the specification’s high extensibility the group will start to work on extensions after the first draft has been delivered. In future OCCI might become a provider of a complete Cloud computing interface stack which covers IaaS as well as PaaS based offerings. OCCI plays a major role in today’s Cloud computing standardization efforts. The group is actively collaborating with other groups from SNIA for storage and DMTF for management standards. A white paper has been published describing how SNIA’s Cloud Data Management Interface and OCCI can work in conjunction. The work is also featured on the http://www.cloud- standards.org wiki where Cloud related standards are coordinated by the major Standards Development Organizations (SDOs). The OpenNebula team is proud to announce the dawn of the OpenNebula Cloud. both of them are accesible using two interfaces: OCCI and EC2. demand for personal uses, but rather to test OpenNebula cloud functionality. creation of an ecosystem built on top of OpenNebula clouds.